commented on "Dining Chairs Reupholstered in a Classy Black Velvet." 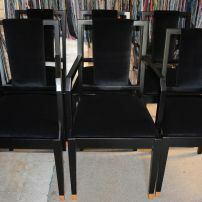 Dining Chairs Reupholstered in a Classy Black Velvet. Send through your chair pictures for a recovery price in velvet to enquiries@jaro-upholstery.com.au. Please indicate location if pick up and delivery are required.